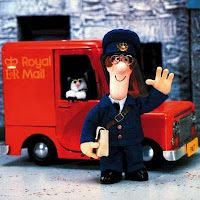 When I was in the six form at school, I got a temporary job over the holidays doing the Christmas post with the Royal Mail. After some sorting, we went out delivering and I got the plum posting as sidekick to the van driver, so got to stay in the warm cab for a large part of the day, lucky me ! Some 32 Christmases later, I again have some temporary Christmas work. 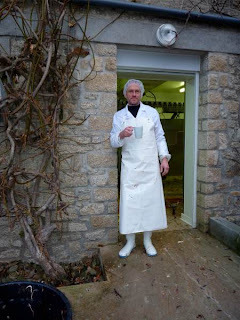 Sylvain’s free-range poultry farm in the middle of our village is working flat out to put a turkey, capon, duck, guinea fowl or chicken on all his customer’s tables and one (of two) of his ladies in the abattoir is long term sick, so he advertised for a preparateur/preparatrice de volaille. In the spirit of helping out a friend in the village (I go to a table tennis club with Sylvain and his sons) filling a small end-of-year hole in our finances and seeing another aspect of farming life, I signed up. Having spent what seemed like the entire night looking at the luminous hands on my alarm clock, I arrived for work at ten to six. Seeing the light on in Sylvain’s kitchen, I wandered over. His dog was unsure of the stranger in the dark courtyard and, after a lot of barking, decided to bite me on the back of my leg … not the most auspicious start to my new career. Sylvain is up at four to collect the birds, breakfasts around quarter to six, works until (an often late) lunchtime without a break and even then, his working day is barely half done. Evelyn, the stalwart préparatrice is the perfect employee. Eight years of working in the abattoir hasn’t dimmed her enthusiasm: she works like a machine. She’s a lovely lady but communication wasn’t easy in the beginning. I start knowing nothing. My teacher has the French equivalent of a strong Somerset accent, doesn’t articulate her words and all this against the roar of the mechanical plucking turbine, a noisy extractor fan and an echo. I think my French isn’t half bad but I reckon I understood less than 10% of anything she said, so I had to watch and try to work it out. Which would be fine, if her demonstrations weren’t conducted with lightening speed and sleight of hand becoming a professional magician. It’s a wonder I managed to achieve anything. The poultry are handled calmly and stunned before slaughter, so I can assure you that the path from free range bird to oven ready is as humane as can be. It was very hard work and I now have even more respect for Sylvain and his staff. The ironic ending to this tale is that on Christmas Day, we’re eating vegetarian (with Gabrielle’s daughter, Christina and boyfriend Bob) and on Boxing day, vegan (an invitation to dine with friends Virginie and Éric). Photos show me during a brief tea break and my mentor, Evelyn, the latter taken by our friend Clive Eggington when he was last here on holiday with us. 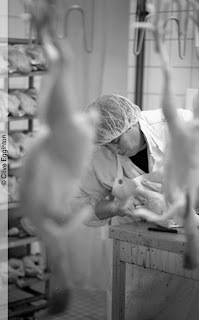 My first job in France was 8 days spent in a chicken abattoir in Serent (the one that does a lot of the cheap supermarket packs in Brittany) - I hated it, to start with (having never done that sort of work before) but I needed the money. After a couple of days though, I grew to understand that it want too bad. I eat meat and enjoy it. Even though it was a commercial abattoir, I was impressed by the speed of despatch and the cleanliness.